HH Wells Residence, 428-430 M Street NW (2006). In 1887, towards the end of his career, Adolf Cluss and his partner Paul Schulze designed this house at 428-430 M Street NW for Henry H. Wells, Jr. It is the last surviving residence designed by Cluss.Born in Michigan, Henry Wells Jr. and his mother and sister settled in Alexandria, Virginia, during the Civil War, where Henry Wells Sr. served as Provost Marshall for the Union Army. After the senior Wells served two years as the military Reconstruction governor of Virginia, President Grant appointed him U.S. Attorney for Eastern Virginia and his twenty-two year old son, H.H. Wells Jr. Assistant U.S. Attorney. In 1875, Grant appointed both men to the same positions for the District of Columbia. In 1879, the father and son resigned to start a Washington law firm. Adolf Cluss dominated Washington's architectural scene from the mid-1860s to his retirement in 1890. As a city planner and engineer, he also helped to shape the very appearance of the city's streets and houses. Yet most Washingtonians today know little of this German immigrant's work, or of his youthful activities as a Marxist writer and organizer during and after Germany's Revolution of 1848. Cluss broke into the field of architecture in Washington at the age of 39, when he and his partner, Josef Wildrich von Kammerhueber, won a competition for the plan for a new elementary school, the first of eight innovative schools they designed. Two of those buildings survive: the Franklin and Sumner schools. Soon Cluss, alone or with partners, won contracts for many of Washington's major public buildings of the post-Civil War years. Cluss designed three of the four buildings built on the south side of the Mall by 1890, including the Smithsonian Arts and Industries Building (the original National Museum), the only one of the three that still survives. He designed at multiple churches, a hospital, market houses in Washington and Alexandria, and an opera house in Baltimore. His Eastern Market, Masonic Lodge, Calvary Baptist Church, a Fire Station, and one residence in Washington and the City Hall in Alexandria also survived. Though public buildings seemed to interest him most, he also entered the booming housing market during the Washington's rapid growth after the Civil War. He designed elaborate row houses for the new wealthy class of the city, as well as Washington's first apartment building, almost all replaced in the 20th century by commercial buildings. As the city's engineer and member of the Board of Public Works in the early 1870s, he superintended the extensive street paving and grading, and the design and building of the city's sewage system. Evidence also suggests that Cluss developed the plan that narrowed Washington's unusually wide streets, and encouraged property owners to plant gardens on the leftover street right-of-way in front of their houses. His plan decreased the city's responsibility for paving and street maintenance, and encouraged homeowners to beautify the city land in front of their houses. He also proposed the regulation allowing construction of houses with bays, porticos, and towers extending four feet beyond the front property lines. 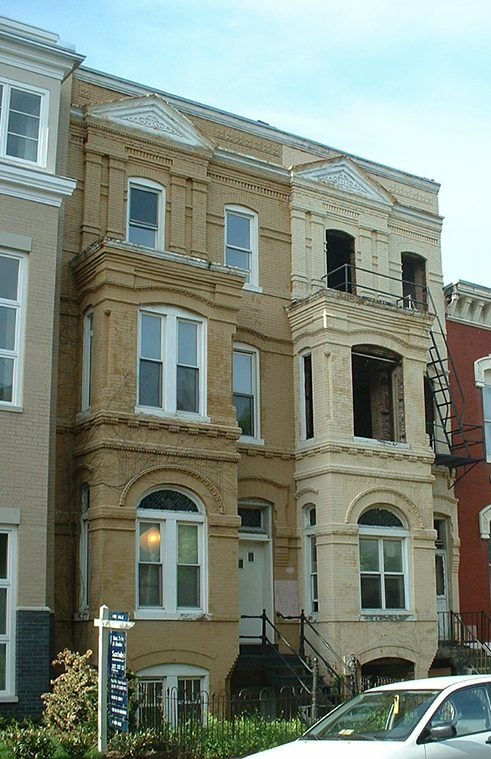 With their varied fronts and small yards and gardens, Cluss's proposals made Washington's row houses distinctively different from row houses in other east coast cities. Cluss also suggested the tree planting commission which in the following years planted thousands of trees along most of Washington's streets. During his professional career, however, Cluss successfully concealed the role he played in his twenties as a friend of Karl Marx and a leader in the communist movement. In biographical accounts Cluss recorded that he was the son and grandson of architects in the German Kingdom of Württemberg, that he worked as a engineer in railroad construction in the Rhine Valley, that he emigrated to the United States in 1848, and moved to Washington, working in several government agencies as a draftsman. A half-century after his death more facts emerged from European sources. Cluss met Karl Marx in Brussels and joined the Communist League. He became secretary of the Communist League in the city of Mainz, and represented workers as a propagandist and leader in the Revolution of 1848. After the failure of the revolution, Cluss emigrated to the United States. For nearly ten years he corresponded, often weekly, with Marx, Marx's wife, Jenny, Frederick Engels and other leaders of the communist movement in Europe. He wrote articles for German-American newspapers and traveled to participate in worker's meetings. Marx admired Cluss. In 1851, he said, "He is one of our best and most talented men, and the following year, he said of Cluss, "As an agent, the fellow's beyond compare." By 1858, however, Cluss became disillusioned. There is no evidence of a falling-out with Marx. In fact, Jenny Marx's account of Cluss's visit to London in 1858, apparently to end his relationship with Marx, suggests an emotionally divided man. More likely, the always-practical Cluss concluded that communism had little future in the social and political environment he found in the United States. His employment as surveyor and draftsman for federal agencies, moreover, must have stimulated his professional interests and thoughts of his future possibilities in Washington. His marriage in 1859 also suggests that in a still strange land, he desired the security of a family life. Becoming a respected and prosperous member of Washington's middle class, Cluss's clients included federal and city governments and wealthy capitalists. He became a friend of President Grant and other political and military leaders. What he thought of the United States' growing labor disputes and violence in the 1870s, or of the publication of Das Kapital, or the death of Marx in 1883 remains Adolf Cluss's secret. Though probably no longer a Marxist, Cluss's devotion to improving the man-made environment of the nation's capital, and building attractive but functional public buildings, suggests that he retained from his youthful idealism and experiences in Germany a vision of a good society. Joseph L. Browne, Ph.D., Director, Adolf Cluss Project.